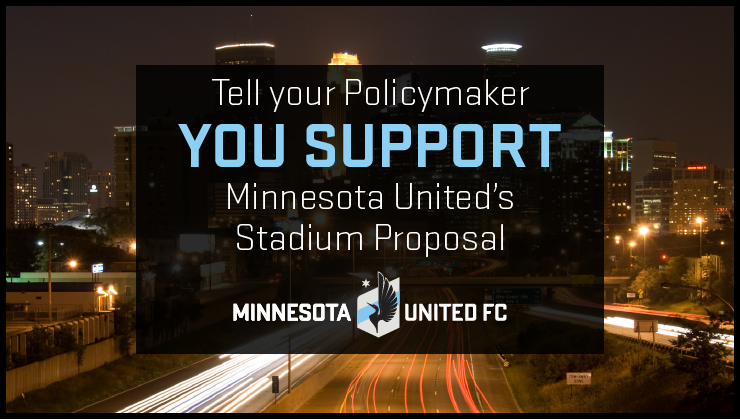 Minnesota United has begun a campaign asking for those in favor of its new Major League Soccer stadium to contact their local leaders in support of its construction. MLS announced that Minnesota United would be its 23rd team last month, with the Loons to begin play in 2018. In the meantime, the team and its supporters need to build a stadium suitable for MLS. The proposal the team has put forth is for the Farmers’ Market site in Minneapolis’ West Loop near both Target Field and Target Center. At around 20,000 capacity and soccer-specific, the stadium would fit right in with other recent MLS stadiums, such as Avaya Stadium (San Jose Earthquakes) or BBVA Compass Stadium (Houston Dynamo). The team is asking for fans to back the $250 million dollar privately-funded stadium (that means no tax dollar subsidies) that also intends to develop the West Loop area and the farmers’ market, but the team is looking for a bit of a tax break. At the bottom of the team’s page are the policymakers’ contact information and if you believe in the stadium proposal, why not go for it?